What can I do to protect my eyes from ultra violet sunlight? Ultraviolet radiation (UVR) can damage virtually every ocular tissue. The damage done by UVR is accumulative over the course of a lifetime. On average, almost 50% of UVR dosage may be acquired by the age of 18. Some of the potential effects include a sunburned cornea or retina, cataracts, new growths on the front of the eye and macular degeneration. To protect your precious eyes, one should wear spectacle lenses that are specially coated to block out UVR. If you do not wear glasses or contacts lenses, non prescription sunglasses that block at least 99% of the UVR are recommended. For additional protection consider wearing a hat with a wide brim. It is never too early to start protecting your eyes from the hazards of ultraviolet sunlight. What should I do if I get something in my eye? First off, never rub your eyes. This can cause the foreign body to adhere to the eye. Initially, irrigate the eye. If the foreign body is not embedded it should rinse out. If this does not make the eye feel better, the foreign body may be embedded in the eye. These need to be removed by your eyecare professional. Also any high impact, high velocity vertical that hits the eye can actually perforate and cause complications. It is estimated that 3 million Americans have glaucoma. Up to 50% do not know they have glaucoma because it usually has no symptoms. Untreated, glaucoma is one of the leading cases of irreversible blindness. In most cases there are no warning signs until the later stages of the disease. Some of these symptoms are loss of side vision. difficulty focusing on close work, headaches and eye pain. Glaucoma can effect young and old. The best way to find out if you have glaucoma is to have yearly eye health examinations. Protect the health of your eyes by calling for an appointment today. What’s new in Contact Lenses? There has been a lot of new advancements in contact lenses. If you were ever told you could not wear contact lenses because you had too much astigmatism or because you need bifocals, we now have options for you. Most of the soft contact lenses are now offered in frequent replacement or disposable. This means more comfortable lenses with convenient care systems. 1-day contact lenses is also great for those who wear contacts for certain occasions or have a history of allergies. If you would like more information about contacts lenses, stop by and see what we have to offer. Diabetes is the leading cause of blindness among working-age Americans. It is caused by an inability to properly use and store sugar. The most common cause of vision loss is due to diabetic retinopathy. This occurs when high levels of sugar in the blood damage the delicate blood vessels in the retina. In early stages, the blood vessels become leaky and cause the retina to swell. The poor circulation and lack of oxygen may lead to the formation of new blood vessels. These new blood vessels are very fragile and break easily, causing hemorrhaging and scarring inside the eye. Fortunately, diabetic retinopathy is treatable and vision loss is preventable in the vast majority of cases. The best way to prevent diabetic retinopathy is to have well controlled blood sugar levels. Weight control, exercise, and diet, along with a yearly eye examination are all very important to reduce your risk of diabetic complications. Protect the health of your eyes by scheduling your diabetic evaluation today. Common refractive eye disorders such as nearsightedness, farsightedness and astigmatism can be corrected with refractive surgery. There are both physical and lifestyle consideration factors involved in the decision making process. Many people want to become less dependent on their glasses or contact lenses due to their hobbies or career. There are also several physical factors, such as the degree of your refractive error, age and health of the eye. 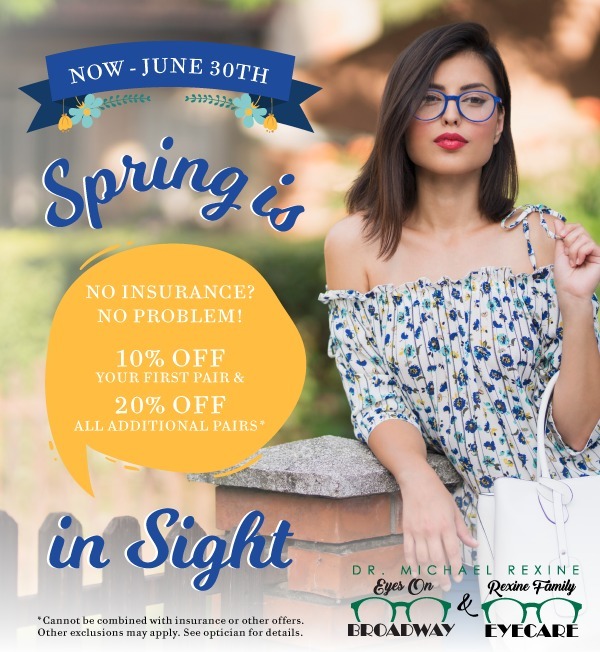 If you are interested in refractive surgery, start with a regular eye examination at Rexine Family EyeCare, or stop by and pick up a free brochure and refractive surgery. How often should I have and eye exam? I recommend that you have a yearly eye exam. Certain eye conditions will require more frequent follow-ups. An annual eye exam is very important for patients who wear contact lenses to evaluate the fit of the lens, prescription, and any changes in the health of the cornea. At what age should my child have her first eye exam? A baseline eye exam as a toddler is warranted if you have specific concerns about your child’s vision or if there is a family history of eye problems at an early age. Even though a child’s vision is not fully developed until about the age of 9, it is recommended that all children have their eyes examined before entering their first year of school. It is important to evaluate vision, binocularity and focusing. A decrease in any of these areas may cause added stress in learning. Children may need to have their eyes examined at an earlier age if your notice any eye turns or squinting. A child’s vision is very precious and should be examined on a regular basis.